I made this complex-looking cardboard windmill in just one evening! 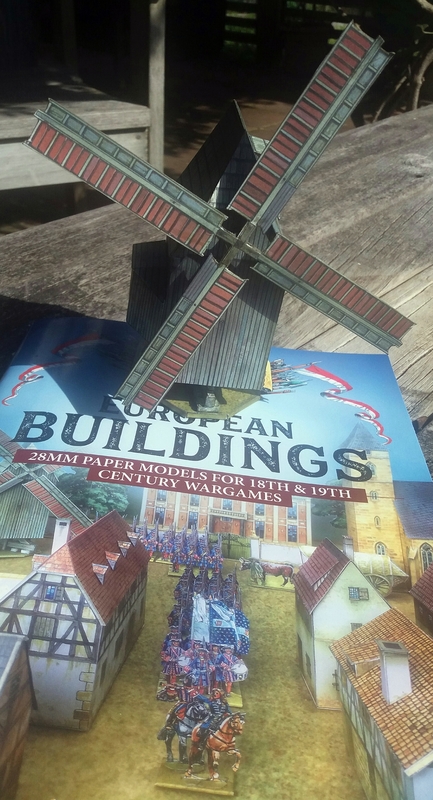 It's a cut-out model from Helion Publishing's latest Paperboys book, 'European Buildings: 28mm paper models for 18th & 19th century wargames' by Florian Richter and Peter Dennis. 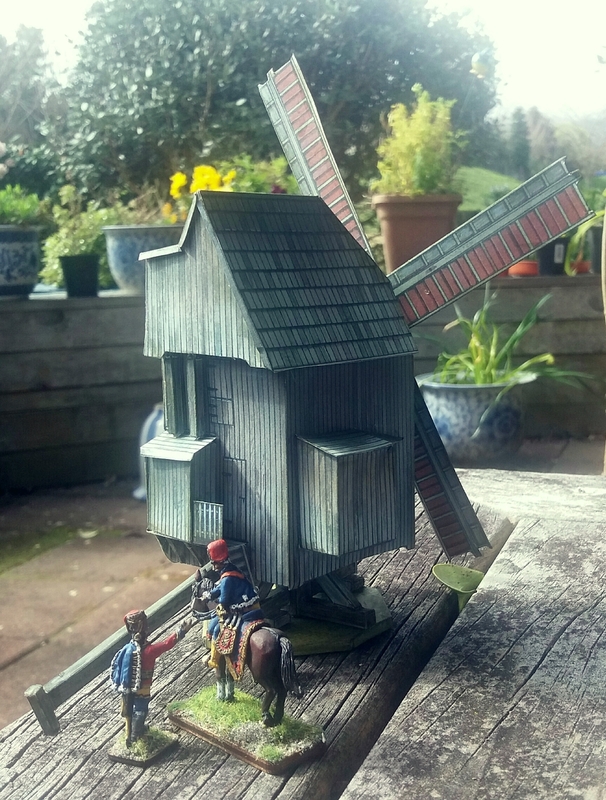 Despite the intricate design of this windmill, with protruding attics and overhanging annexes, it was surprisingly easy to make. It was simply a matter of scoring all the folds, cutting out the pieces, folding them into shape, and gluing. Everything fitted perfectly. Looks good. I've gone to card buildings for a lot of my gaming. I'll have to pick up this book. Are there any books like that for 15mm or HO? Hi Dan … you can simply photocopy the pages at slightly reduced size. A commercial photocopier will copy them onto light card for you. Actually, I suspect they would work fine 'as is' for HO, because the designers purposely under-sized these models a bit for 28mm anyway so as to reduce the table footprint. Dan, check Amazon for Schreiber Bogen. They make quite a bit of stuff in HO (or smaller). Surprisingly speedy delivery, too. This book is brilliant. I like the undersized designs as I use 1/72 or HO buildings on my table. Overall they fit in well and are ideal for 'bulking out' plastic models. I was particularly pleased to see that the colour schemes for the Spanish buildings fit in with mine. No anachronistic 'all white'. Highly recommended. I just checked Amazon for this. Not being released until November…for $39.95 USD! I'll check around for those HO ones.